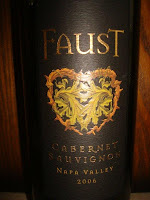 Last night, we enjoyed one of my favorite wines from Napa Valley, a bottle of 2006 Faust Cabernet Sauvignon. I almost always have a bottle of this in the house and it is one that my husband and I frequently order at restaurants when we are having any type of steak. We have introduced numerous friends to this wine and they always love it. On the nose, there is intense black cherry with vanilla and smoky aromas; on the palate, there is more rich black cherry flavor with dark chocolate and a bit of chili pepper. It is always perfectly balanced. A medium+ body with mild tannins ending with a lightly spicy, fruit-filled lingering silky finish. Always absolutely perfect!